In a remote fishing village in Iceland, teenage boys Thor and Christian experience a turbulent summer, as one tries to win the heart of a girl, while the other discovers new feelings toward his best friend. When summer ends and the harsh nature of Iceland takes back its rights, it's time to leave the playground and face adulthood. Set in remote fishing village in Iceland, "Heartstone" introduces us to two teenage boys Thor and Christian as they experience a summer where one tries to win the heart of a girl while the other discovers new feelings toward his best friend. When summer ends and the harsh nature of Iceland takes over, they realize that the time has come to movie into adulthood. 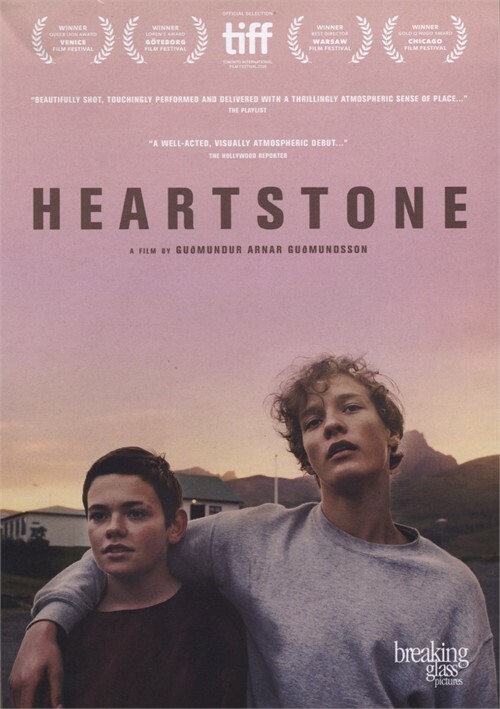 "Heartstone" shows us the dramatic hardships of cruel, confusing adolescence and fumbling sexual awakenings and does so with detail, and both come from first-time director Guðmundur Arnar Guðmundsson. The film captures a community of wayward youth in an Icelandic fishing village. We focus on fourteen-year-old Thor (Baldur Einarsson), a angelic-looking boy whose voice is maturing faster than his body, and his best friend Kristján (Blær Hinriksson), a tall, blonde withdrawn teen. Both teenagers are on the verge of manhood, with Thor directing his attention to one of the local girls and Kristján silently harboring feelings for Thor. Set mostly outdoors against a gorgeous landscape, we get powerful performances from young people with no formal acting background. Adolescence in the cinema is not new and we have begun to see more and more films about it. The fact that this is something every person goes through makes it a unique experience that is too personal to share. This is exactly what lies behind the movie: a personal story based on the director's experience of growing up in a remote fishing village. Like in any Scandinavian film, nature is a part of the story. What makes this story different is that it is, above all, about human nature. Our story takes place surrounded by a cold sea, flat grounds and green mountains and the natural harshness and beauty are the yin and yang of this story. This is a story of a strong, beautiful bond between two boys that is framed with aggression and violence from the very first moments. In the opening scene we see an act of meaningless aggression by one of the boys calling a fish ugly and then jumping on it. We learn that Thor is exposed to constant humiliation thanks by his sisters and he lets his inner aggression out in a form of offending other people, spitting and kicking the grass. We wonder if there is any escape from this world of cruelty. This is the world that the characters here live in and they are used to it- it is the normal world to them. The film is made up of many separate details including the relationship between parents and children, homosexuality, life in a rural village and life in a closed society, first love, awakening sexuality, puberty, closed society, friendship, suicide. What the film is really about is discovering one's true self and this is a painful and harsh process from which no one can escape. We are all exposed to this at an early age and we see here that with no support, it is impossible to express feeling about going through it.. There is always something left behind afterwards and it defines our lives and who we are. The story here is about awkward, obstinate teenagers becoming grown-ups and they are still awkward and obstinate but a little bit wiser, stronger and better.